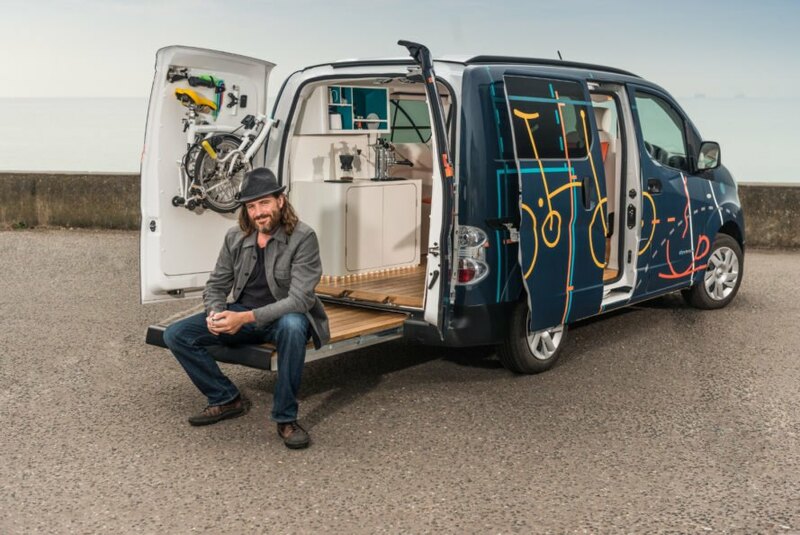 Nissan recently collaborated with UK-based <a href="http://www.studiohardie.com">Studio Hardie</a> to turn its emissions-free van into a tiny <a href="https://inhabitat.com/?s=mobile+office&amp;_=1478190934">mobile office</a> space. 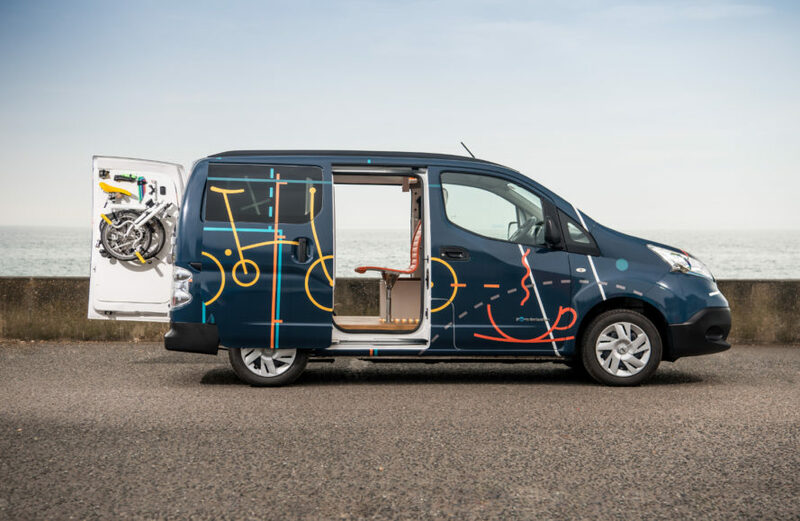 The e-NV200 WORKSPACe is the <a href="http://designtaxi.com/news/389495/Nissan-Unveils-The-First-All-Electric-Mobile-Office/">first all-electric traveling office in the world</a>, complete with a fold-out desk, wi-fi, a Bluetooth audio system, a mini-fridge, and a fancy espresso machine. The <a href="https://inhabitat.com/?s=electric+vehicle&amp;_=1478190947">electric vehicle</a> can reach an 80 percent charge in just 30 minutes, and daylight pours into the workspace through a panoramic glass roof, illuminating the bright color scheme inside. 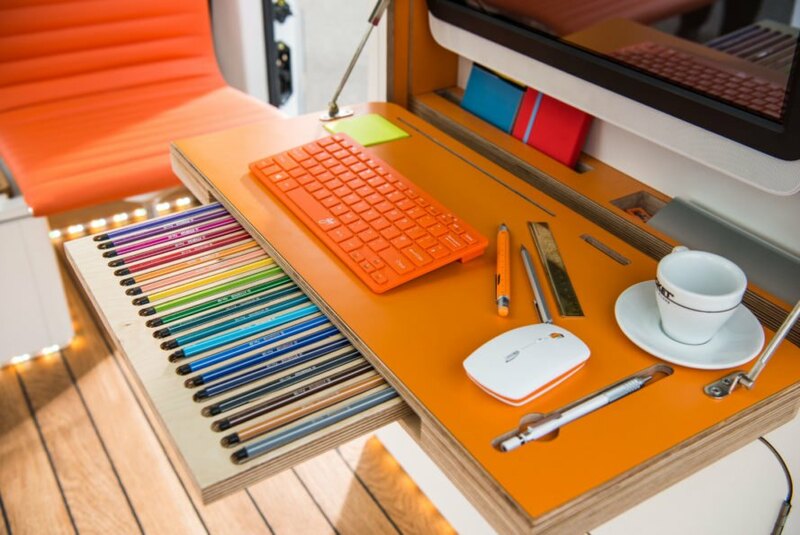 The e-NV200 WORKSPACe concept meets all the needs of the worker who hates to be stuck in the office. <a href="https://inhabitat.com/?s=LED+lights&amp;_=1478190965">LED lights</a> controlled by your smartphone, wireless phone charging capabilities, and a touchscreen computer make the tiny space incredibly user-friendly and a mount for a foldable Brompton Bike allows gives workers the option to hit the trail during breaks. Bright daylight pours into the workspace through a panoramic glass roof, illuminating the bright color scheme inside. The space is equipped to handle one person or two co-workers on laptops with mounts for two desk chairs. Alternatively, sitting outside on the pull-out floating desk gives more room and a front row seat to the natural surroundings. A central console contains a drawer-system mini-fridge and wireless <a href="https://inhabitat.com/?s=smartphone&amp;_=1478190980">smartphone</a> charging dock and the fold-down desk reveals a touchscreen computer, wireless mouse and keyboard, and plenty of storage for office supplies. 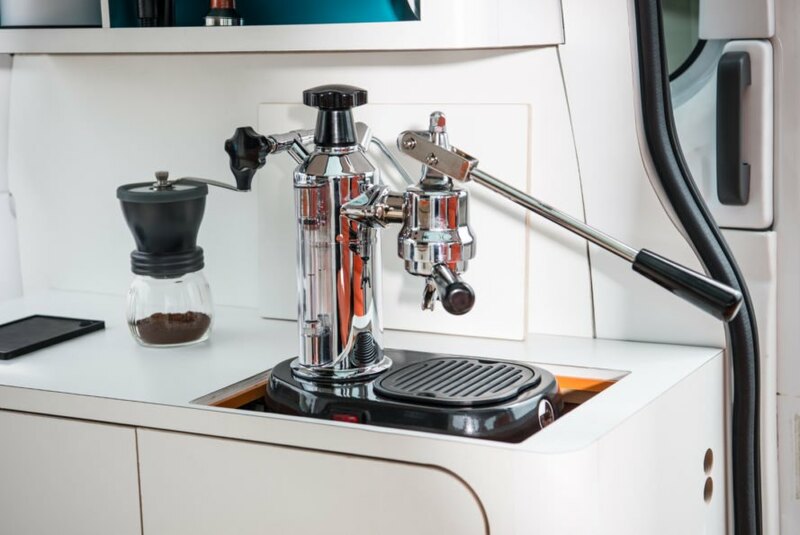 There is even an espresso machine! 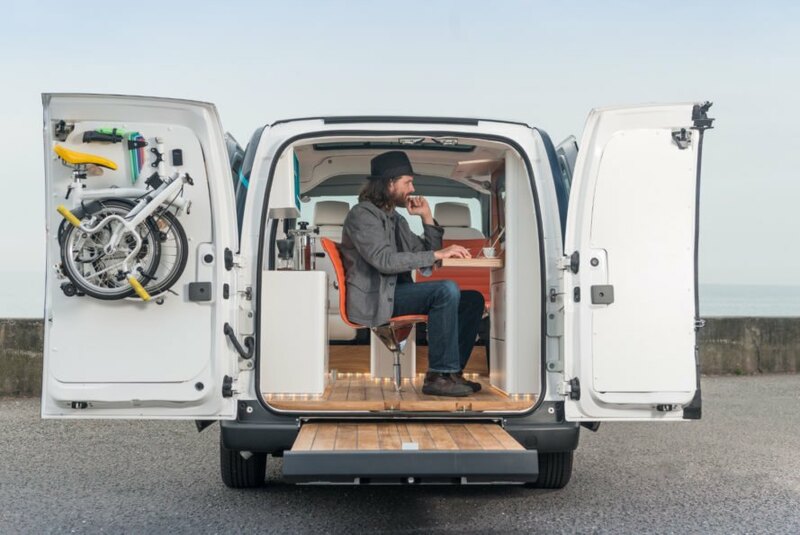 The e-NV200 WORKSPACe technology and design can be seen as an attempt to keep up with the amount of co-working and hot-desking spaces around the globe, which <a href="http://www.deskmag.com/en/first-results-of-the-new-global-coworking-survey-2015-16">grew 36 percent in 2015</a>. 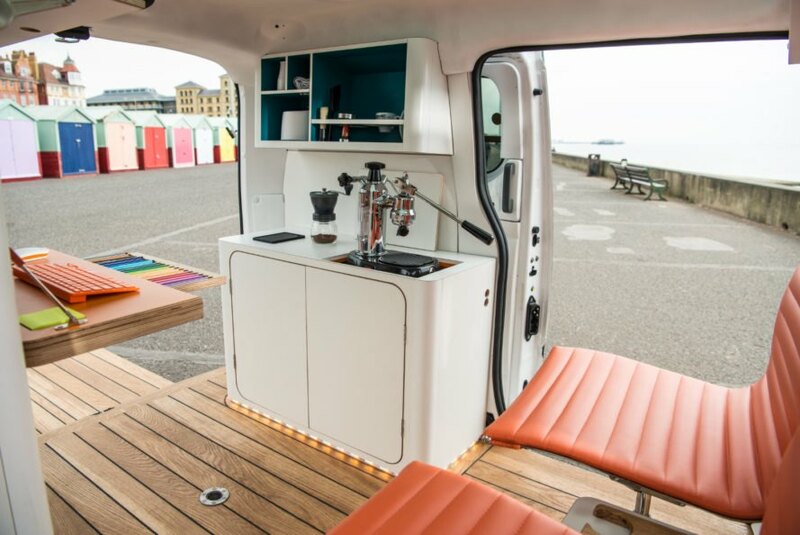 Nissan recently collaborated with UK-based Studio Hardie to turn its emissions-free van into a tiny mobile office space. 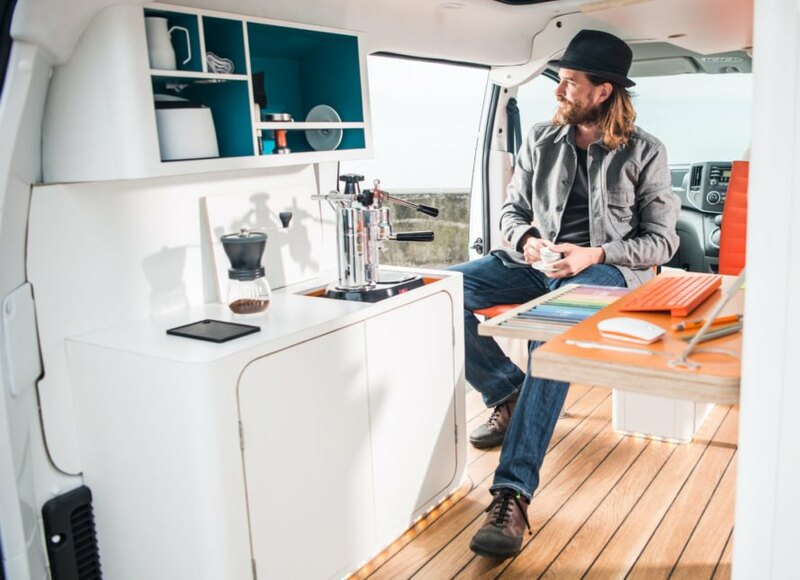 The e-NV200 WORKSPACe is the first all-electric traveling office in the world, complete with a fold-out desk, wi-fi, a Bluetooth audio system, a mini-fridge, and a fancy espresso machine. The electric vehicle can reach an 80 percent charge in just 30 minutes, and daylight pours into the workspace through a panoramic glass roof, illuminating the bright color scheme inside.